Generally speaking, and all the lawyers who are qualified to speak on it can chime in if they wish, if you are are an official representative of one country doing official business in another, you have diplomatic immunity. Unless your home country decides for its own reasons to waive such immunity you usually aren't subject to prosecution by your host nation. All they can do is expel you. Consider this a form of guest right, if you will. No one kills, arrests, or otherwise harms the messenger. It's bad form. It would open up your diplomats and representatives to similar treatment if you went around, justifiably or not, arresting or abusing foreign diplomats. But the deal in having diplomatic immunity is that the foreign diplomat or other representative is supposed to live by the laws of the host nation. Some diplomats or other representatives have a problem doing this. 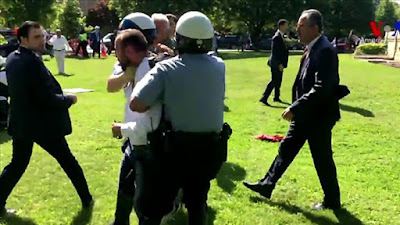 The latest example of this, and it's by no means limited to Turks, occurred recently in Washington D.C. where members of the Turkish President's security team and apparent Turkish embassy staff, charged through a line of D.C. police officers to kick, punch and pummel a group of mostly Armenian-American and Kurdish-American protesters. For whatever reason the D.C. police did not use deadly force. Arguably they should have done so. American citizens have been killed by police for far less. There isn't a tradition of free speech in Turkey. 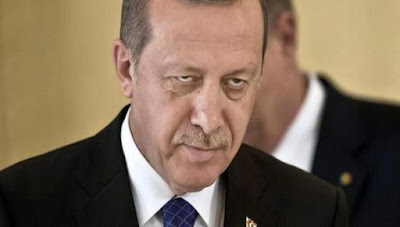 Turkey is under the rule of an authoritarian President with a thin skin and a history of bullying. Hmm.That last part sounds familiar doesn't it? Turkey has been unable to acknowledge, let alone apologize for the Armenian genocide and discrimination against or extra judicial killings of Kurds. Merely mentioning those things in Turkey, let alone writing about them is a good way to lose your job, wind up in prison or catch a fist to the face. But America is not Turkey, fortunately. I can point out as much as I want the ugly Turkish history of conquest, brutality, imperialism and colonization. And America would be making a mistake to allow Turkey or any other country to eliminate our tradition of free speech. This is an example of when the police would have been within their rights to escalate the force they used. I am trying to imagine a situation where I could put hands on police and not be at the very least tased. Oh who am I kidding. I would have been shot. And if Turks can't behave themselves in the US then they should be forced to leave. What kind of morons attack the Secret Service? You can't reason with violent people. Once violence starts all you can do is stop it via superior force. WASHINGTON — Supporters of President Recep Tayyip Erdogan of Turkey, including his government security forces and several armed individuals, violently charged a group of protesters outside the Turkish ambassador’s residence here on Tuesday night in what the police characterized as “a brutal attack.” Eleven people were injured, including a police officer, and nine were taken to a hospital, the Metropolitan Police chief, Peter Newsham, said at a news conference on Wednesday. Two Secret Service agents were also assaulted in the melee, according to a federal law enforcement official. The State Department condemned the attack as an assault on free speech and warned Turkey that the action would not be tolerated. “We are communicating our concern to the Turkish government in the strongest possible terms,” said Heather Nauert, a State Department spokeswoman. A group of Republican lawmakers went a step further, calling the episode an “affront to the United States” and calling for Turkey to apologize. The initial rush devolved into several smaller skirmishes as uniformed police officers, some in helmets and swinging collapsible batons, struggled to restore order. The Anadolu Agency, a state-owned Turkish news service, reported that members of the president’s security team were involved in the attack. The confrontation came after President Trump welcomed Mr. Erdogan to the White House on Tuesday and praised him as a stalwart ally in the battle against Islamic extremism. Mr. Trump did not speak of Mr. Erdogan’s authoritarian crackdown on his own people. The White House has thus far been silent on the episode. Sean Spicer, the White House press secretary, referred reporters to the State Department and declined to comment further. The Turkish embassy released a statement late Wednesday that contradicted United States officials and video evidence and blamed the demonstrators, who, it said, had been “aggressively provoking Turkish-American citizens who had peacefully assembled to greet the president.” The president’s supporters and security forces were reacting in self-defense, the statement said. Regardless of the particular Turkish sensitivities and inferiority complex masquerading as a superiority complex it is important to point out that the Washington incident is an illustration of what happens when someone doesn't believe in free speech and the right to assemble peaceably. Violence will follow. This is why I believe free speech is so critical to a functioning modern society.